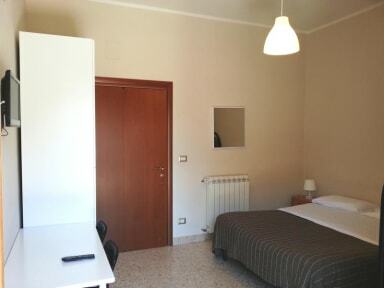 The Bed and Breakfast dei templi is a modern apartment situated 5 minutes on foot from the historical center of Agrigento... and from the Train and bus main station, 2 kilometers far from the temples and a couple more frome the beach. The atmosphere is pleasant and familiar, in a modern building. Patrizia will receive you with the smile and will be ready to help you and to address you towards the greater interest sites. The rooms are cleaned up to the departure and before the arrival of the guests, while the rest of the house comes daily maintained in order. The place for bikes and motorbikes is guaranteed from a wide garage. In the same street there are several alimentary kinds, bakeries and takeaway pizzas. The hostel located in the downtown center, less than 10 minutes from the train station. Due to the special terrain of the city, it might be hard for people who come here with trolley case. One more information for people who need luggage deposit service. There is no luggage locker in the train station, however, the bar in the lobby offer this service (2 euro). Just 5 minutes walk from train station and 10 from bus station. A flat that has been converted into a hostel / b&b. Breakfast with a ticket you give to the cafe over the road, coffee and pastry. Handy for shops and a good take away pizza cafe. Thank you for the lovely stay! I travelled there with my brother to visit the Greek temples and the room and bathroom were clean, quiet and secure. The breakfast was also very delicious. Thank you also for the advice about the town. Helpful people and on hand when we needed them. Would stay again.Was good to have a lift to upper floors. Lovely little B&B. The owner happened to see me walking from the bus station with all my bags and gave me a ride to the property! And then because I was the only one staying there, I got upgraded to a private room for the same price as the dorm. It has a kitchen, washing machine, and is very comfortable. About 10 minutes walking from the train station, 15 from the bus station. It is not a hostel but an apartment turned into a B&B. There is no reception but the downstairs neighbor let me in and showed me around, a nice and loud Italian grandma but who speaks no English. I had a two bed room only to myself, with bathroom included, which was amazing and a key to close my room. Sharing it with an unknown person may have made me feel a bit insecure since there were no lockers in the room. There was zero ambiance, but overall a safe and clean place to sleep. No atmosphere, just a converted apartment. Great shower, toilet and kitchen facilities. Make sure you email the guy a day before to organise to be let in or you'll be left waiting for 6 hour like me. Agrigento generally speaking ain't exactly Eden. Also the beds in my room were all as firm as mossy rocks (which I really like, but just a heads up).